Ford Wants Explorer Drivers To Relax With "Mindful Mode"
Time to relax your brain. It’s become normal for us mortals to sit and stare at computer screens all day. In fact, we get paid for the pleasure. It’s called work. And once we’re off the clock we’re addicted to our smartphones. Repeat this process all week. 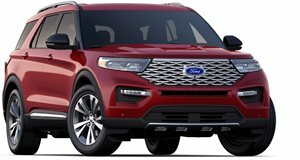 Ford wanted to do something to help force adults to seek a mandatory timeout from our devices, so it enlisted its all-new 2020 Explorer for help. More specifically, the redesigned Explorer offers a feature called "Mindful Mode,” which is available on the 12.3-inch digital cluster. Think of it as a calm screen of sorts. When activated by the driver, Mindful Mode turns off all data so that drivers are not overwhelmed by too much information, like Bluetooth and other alerts. All that will remain on the gauge cluster are fuel and speedometer indicators and, of course, the road ahead. "We live in a world of ubiquitous screens, and the information can be overwhelming. New ‘Mindful Mode’ in the all-new Explorer offers a break from the constant stream of information and alerts bombarding us by giving drivers the option to disengage and take a moment for themselves away from the chaos technology can wreak,” said Lee Newcombe, Ford Explorer brand marketing manager.” Ford simply realized there are too many features today that increase the risk of drivers becoming overwhelmed. After a long day behind a computer with constant smartphone interruptions, why should your vehicle cause even more brain-smoldering information overload? Ford studied theories of meditation and mindfulness when developing Mindful Mode and the goal is for its customers maintain mental wellness by eliminating stress/data that drivers don’t always need to see. For better or worse, smartphones, touchpads, laptops, etc. stimulate the attention receptors in our brains through sounds, shapes and colors, leading to addiction. Mindful Mode’s clean layout and even the blue color were designed and chosen to be soothing and tranquil.